The Draft Small Scale Fishing Policy is presently before Cabinet. It is expected that the Presidency would object to the draft policy as it is contradictory to the findings and objectives of the National Development Plan published by Minister in the Presidency, Trevor Manuel. The National Development Plan (NDP) is an overarching national policy aimed at achieving substantial developmental objectives for the country by 2030. The NDP was prepared by the National Planning Commission, which is chaired by Trevor Manuel and whose commissioners include Cyril Ramaphosa, Tasneem Essop, Karl von Holdt, Bobby Godsell to name a few. The NDP addresses the development role that can be played by South Africa’s fishing industry in contributing to the attainment of the NDP’s Vision 2030. The NDP can be said to be based on two defining objectives – the substantial reduction of poverty and current levels of gross inequality by 2030 by creating a “virtuous cycle of growth and development”. With these objectives and methodology in mind, the NDP states the following about the South African fishing industry and how it can contribute to Vision 2030 (Chapter 6 of the NDP). The NDP identifies fisheries as an economic sector with growth potential, particularly small enterprise development. The NDP recognises that small-scale / artisinal fishers operate low cost operations but fish high value fish stocks. (It is important to note that the small-scale fishing policy is premised on the myth that South African law does not recognise small-scale fishers. Small scale fishers are explicitly recognised as a separate and defined category of fishers in terms of South Africa’s general fisheries policy of 2005 and the various small-scale sector specific fishing policies of 2005. And before that, small scale or artisinal fishers were recognised in terms of the 2001 Fishing Policy). Large scale industrial fisheries employ more than 27 000 people (which accords with Feike’s own research) and that these sectors offer employment conditions that are better than most other economic sectors. The NDP opposes the accommodation of new entrants or additional quota holders as this will only increase the threat to sustainability of our fish stocks. Again, this is contradicted by the small scale fishing policy and recent statements by DAFF that more people need to be accommodated in fishing sectors. The NDP unequivocally favours the allocation of LESS fishing rights of greater value rather than more fishing rights of lesser value. Importantly, the NDP emphasises that quotas cannot be allocated in away that threatens compliance and sustainability. And yet the the Department insists on allocating the interim relief lobster quotas which have proved to be an illegal fishing racket which the department has no control over. The NDP confirms that the fishing sector is transformed and black empowered. The NDP confirms that small-scale fishing cannot be viewed as the solution to unemployment and poverty; rather the solution is to support large scale industrial fishing as these sectors offer better salaries and conditions of employment. Critically, the NDP states that by allocating more small-scale fishing rights (as opposed to focussing on industrial fisheries development) will only cut jobs. Finally, the NDP states that unrealistic expectations have been created by promising communities fishing rights. It is therefore inexplicable that the small scale fishing policy continues to exist! It is even more inexplicable that we have a department and a Minister that continue to make statements about fisheries that are directly contradicted by the NDP: Vision 2030 and its findings and analyses. How is it possible that DAFF and its Minister are unaware of this national overarching plan produced by the Presidency of the Republic? It was clear from Sue Middleton’s presentation to the Portfolio Committee on 24 April 2012, that she was completely unaware of the NDP and its analyses. If government departments such as fisheries has already elected to ignore the NDP, it certainly does not bode well that this rather grand Vision 2030 will ever be more than a fancy document on a nice website. Special Assignment’s analysis of the draft small scale fishing policy showed how the small scale fishing policy will result in a poverty trap for small scale fishers. Perhaps the clearest case against the policy is the co-operative pilot project in Doring Bay which has proved to be an absolute failure but DAFF and its Minister refuse to even to acknowledge the failure of their own pilot project. One must ask why in the face of the Doring Bay failure, and the historic and documented failures of co-operatives such as SACFC (which involved Andy Johnson – a proponent of the current small-scale fishing policy) and Harbour Lights of Kalk Bay, does the fisheries department and its Minister insist on implementing a failed system? Co-operative fishing structures had even proved to be a failure under the NATs. Philip Sothomela (67) has known no life other than the sea. But in 2004 he suffered a stroke that left him unable to perform even the most basic of bodily Today, his wife Makhoti devotes all her time to caring for him. She too was a fisher but his ill-health and their financial problems have prevented her from going back to the sea. Like thousands of other small-scale and subsistence fishers she is pinning her hopes on a new fishing policy that will provide her with the greater access to the sector and secure the future, not only for her desperately ill husband but for her children and grandchildren as well. Almost twenty years since the advent of democracy, life for the traditional fishing communities has become harder. Competition for limited stocks has escalated, poaching and overfishing are on the rise and DAFF’s monitoring capacity has been severely compromised due to corruption and inefficiency. If adequate action is not taken to address this, the consequences for both our marine resources and traditional fishing communities could be irreversible. But will the small-scale fisheries policy provide a safety net for struggling fishing communities along the coast? Or will it be the bait to catch traditional fishing communities in a greater poverty trap, hook, line and sinker? Sue Middleton confirmed to the fisheries portfolio committee yesterday that she had personally signed the service level agreement with the Navy on 13 April 2012. Why they insist on such a destructive public relationship management strategy is beyond comprehension. Why not make the SLA immediately available to the public or why not issue a press statement confirming the signing of such an important document, explaining its implementation, costs and who will be responsible for what? Middleton further confirmed that the SAS Africana, which was supposed to have sailed on 19 April, was still in port and may sail today (ie 25 April). The Africana would conduct back-to-back demersal and pelagic research cruises. Alarmingly, Middleton confirmed that the rest of the fleet will take another 2 months at least to get out to sea – which in fact means at least 6 months in the real world. Talk about an open invitation to the world’s pirates to plunder our seas! Well done DAFF and Minister Joemat-Pettersson for looking after the poachers again! Minister now Abandons her "Committee of Inquiry"
During the course of a fisheries portfolio committee hearing yesterday, Sue Middleton – acting DDG of fisheries – confirmed that the Minister will now not be holding her famed “committee of inquiry” she hastily announced on 21 March 2012. When the Minister announced the “committee of inquiry” which was supposed to unearth widespread tender corruption and maladministration in the fisheries branch, we all hailed it a red herring; a desperate attempt to detract from her Sekunjalo tender woes. Middleton however advised that the Minister has a new goalpost. The Minister has apparently approached the President to set up a commission of enquiry – note COMMISSION – which will be chaired by a retired judge who will now investigate fishing quota allocations! This Minister is truly proving that she is not only at a complete loss as to how to manage fisheries, she is appallingly dishonest. Had the DA not demanded clarity on the status of the March 21 Committee of Inquiry, we may never had known that the Minister was now pursuing another witch-hunt. And we point out again, all this mucking around a mere year before long term quotas need to be re-allocated in a number of fisheries! Finally, Middleton confirmed that the DG, Langa Zita had apparently laid criminal charges against SMIT PENTOW (she was not clear about this – our assumption) but could not provide a case number or where the charges were laid. The Western Cape High Court this morning reviewed and set aside the decision of the Minister of Environmental Affairs to refuse to allocate a WSCD permit to Shark Adventures that operates out of Gordons Bay. The decision is significant as Shark Adventures not only sought to review the decision to refuse it a permit, but also sought to review the authority of the Minister to decide the appeal as it was argued that the Minister of DEA is not permitted under the Marine Living Resources Act, 1998, to regulate the white shark cage diving sector. It was argued that the Fisheries Minister is actually the correct repository of authority over the shark cage diving sector. The full reasons of the court will be made available in due course. Feike advised Shark Adventures on its appeal and its litigation. Shark Adventures was represented by Shaun Hangone of Von Lieres Cooper Barlow Hangone Attorneys and Advocate Darryl Cooke of the Cape Bar. 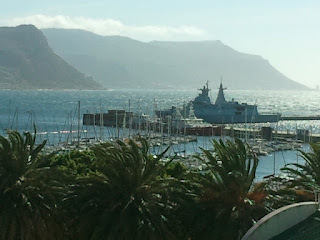 Feike understands that the Africana research vessel (now the SAS Africana as it is a naval vessel) will sail on 19 April 2012 to commence the demersal research cruise. It remains baffling why the Fisheries Minister refuses to communicate openly about the progress being made in getting our patrol and research vessels fully operational once again. Despite the Fisheries Minister’s repeated assurances that the patrol and research vessels will be operational during April, the vessels remain port bound in Simonstown harbour. And Feike has been advised that these vessels will not be able to leave port for at least the next 6 months which will expose South African waters to further rampant and unchecked illegal fishing for an extremely extensive period. In addition, the pelagic research cruise will certainly be cancelled which will mean that the TAC for the second half of the 2012 anchovy fishery will not be capable of being determined based on actual science. Even though the Minister and her advisers will undoubtedly deny it, but we are officially chin-deep in a governance crisis. Fisheries management in this country, which has traditionally been underpinned by internationally recognised fisheries science, has never been so seriously compromised until Joemat-Pettersson insisted on assuming the fisheries throne in Cabinet. So where is that SLA, Minister? So, where is that Service Level Agreement we were all promised 16 days ago by the Fisheries Minister? Remember, we were told that the SLA would be signed WITHIN 14 days of the signature of the MOU that was signed in March (presumably the 30th) between the Fisheries and Defence Ministers? No SLA means our fisheries patrol and research vessels remain stranded, looking pretty in the Autumn sun in Simonstown Harbour. The Business Day today reports that the Minister holds the view that she can withdraw the rights of fishing companies that have changed their “BEE” credentials as this is contrary to the conditions of granting their fishing rights. Unfortunately, our Minister appears to once again not be familiar with the provisions of the Marine Living Resources Act and nature of the fishing rights allocated. Firstly, the Minister does not have the legal authority to make fishing rights subject to “BEE” credentials in terms of section 18. Secondly, none of the fishing rights allocated are subject to such conditions or any condition related to “BEE”, save for specific conservation and management measures as provided for under section 18(7) of the MLRA. Further, criticism of the transfer policy and its limited focus is not anti-transformation. As this BLOG has made clear and as it is apparent from actual case studies in various sectors such as hake long line and west coast rock lobster, enforcement of the transfer policy is in fact undermining black economic empowerment. Unfortunately, our Minister and her advisers choose to remain blissfully ignorant of the economic and social realities of the commercial fishing industry by simply never engaging with industry whether regularly (or at all) or honestly for that matter.